Through the initiative of the president of the UN General Assembly, Mr. Vuk Jeremic, an event was held entitled the “High Level Forum on the Culture of Peace”. The event was convened to discuss implementation of the Declaration and Programme of Action on a Culture of Peace, adopted in December of 2012. 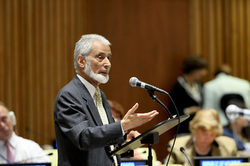 The purpose of this one-day event was to allow political and religious leaders to discuss ways to improve tolerance, dialogue, and mutual respect in the international community. Dr. Sayyid Syeed, National Director of ISNA’s Office for Interfaith and Community Alliances, was invited by Mr Jeremic to speak at the event. He referenced the Quran, 41:34, in his speech which reads, “And not alike are the good and the evil. Repel (evil) with what is best, when lo! he between whom and you was enmity would be as if he were a warm friend.” In reference to the Srebrenica massacre of 1995 he said “[This verse] invites [Bosnian] Muslims to overcome grief and vindictive anger… creating a culture of peace with those who are living there and may have been involved in the [atrocities].” Dr. Syeed also outlined how different religions can work together, recalling churches in the United States that had invited Muslim immigrants in the 1950s and 60s to use their facilities for Friday prayers. Prestigious invited guests who spoke alongside Dr. Sayyid Syeed included Serbian Patriarch Irinej, as well as Rabbi Ali Abadi of of Congregation Beth Torah in Brooklyn . The event continued with three panel discussions related to the theme with world organizational and governmental leaders.